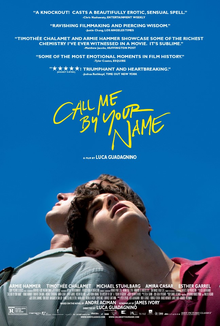 ‘Call Me By Your Name’ is a romantic coming of age drama set in Northern Italy at the height of summer, based on a 2007 book by Andre Aciman and adapted for the screen by Luca Guadagnino. It follows the relationship that blossoms between 17 year old Elio (Timothée Chalamet) and Oliver (Armie Hammer), an American academic who has been hired by his father to come over for six weeks and support him with some work. It’s a beautifully written and beautifully directed piece of work from Guadagnino, and it features two (maybe three) of the finest performances you’ll see this year against a simply spectacular setting, and I’d happily have spent more time engrossed in this movie. This is a film about young love, lust, romance and all that comes with it, and it’s played out superbly by Chamalet and Hammer. Armie Hammer’s chosen some interesting roles of late and he’s very good here, but it’s Chamalet who really shines. He’s had some previous roles in acclaimed works such as ‘Homeland’ and ‘Interstellar’ but it’s here he really shows what he can do, giving one of the best coming of age performances I’ve ever seen, covering every range of emotion as Elio goes through these experiences. The end credits scene in particular is a mesmerising showcase of acting for Chamalet and it blew me away, frankly, reminding me of Tom Hanks tour de force at the end of ‘Captain Phillips‘, which is the highest praise I can give. Throughout the film Elio is discovering his own sexuality, and his relationship with Oliver has the feel of a holiday romance as both share an experience that they ultimately know can only have one outcome. I particularly loved the conversation Elio has with his father towards the end (an also excellent Michael Stuhlbarg) which superbly shows what a great parent he is whilst also neatly tying the film’s themes together. Italy is a wonderful country and Guadagnino knows how to shoot it (‘A Bigger Splash’ was also great in this regard), and ‘Call Me By Your Name’ made we want to go right ahead and book a flight there again. Accompanying the action on the screen is an unobtrusive soundtrack that rises at just the right moments, with the Sufjan Stevens tracks feeling particularly evocative of what is going through Elio’s head at the moments in which they appear. I thought ‘Call Be My Your Name’ was a terrific piece of cinema, a powerful and moving tale of first love with great performances from Timothée Chalamet and Armie Hammer, and I hope it gets the attention it richly deserves.